Towards the end of his most influential work, Critique of Pure Reason(1781/1787), Kant argues that all philosophy ultimately aims at answering these three questions: “What can I know? What should I do? What may I hope?” The book appeared at the beginning of the most productive period of his career, and by the end of his life Kant had worked out systematic, revolutionary, and often profound answers to these questions. At the foundation of Kant’s system is the doctrine of “transcendental idealism,” which emphasizes a distinction between what we can experience (the natural, observable world) and what we cannot (“supersensible” objects such as God and the soul). Kant argued that we can only have knowledge of things we can experience. Accordingly, in answer to the question, “What can I know?” Kant replies that we can know the natural, observable world, but we cannot, however, have answers to many of the deepest questions of metaphysics. Kant’s ethics are organized around the notion of a “categorical imperative,” which is a universal ethical principle stating that one should always respect the humanity in others, and that one should only act in accordance with rules that could hold for everyone. Kant argued that the moral law is a truth of reason, and hence that all rational creatures are bound by the same moral law. Thus in answer to the question, “What should I do?” Kant replies that we should act rationally, in accordance with a universal moral law. Kant also argued that his ethical theory requires belief in free will, God, and the immortality of the soul. Although we cannot have knowledge of these things, reflection on the moral law leads to a justified belief in them, which amounts to a kind rational faith. Thus in answer to the question, “What may I hope?” Kant replies that we may hope that our souls are immortal and that there really is a God who designed the world in accordance with principles of justice. In addition to these three focal points, Kant also made lasting contributions to nearly all areas of philosophy. His aesthetic theory remains influential among art critics. His theory of knowledge is required reading for many branches of analytic philosophy. The cosmopolitanism behind his political theory colors discourse about globalization and international relations. And some of his scientific contributions are even considered intellectual precursors to several ideas in contemporary cosmology. This article presents an overview of these and other of Kant’s most important philosophical contributions. It follows standard procedures for citing Kant’s works. Passages from Critique of Pure Reason are cited by reference to page numbers in both the 1781 and 1787 editions. Thus “(A805/B833)” refers to page 805 in the 1781 edition and 833 in the 1787 edition. References to the rest of Kant’s works refer to the volume and page number of the official Deutsche Akademie editions of Kant’s works. Thus “(5:162)” refers to volume 5, page 162 of those editions. Kant was born in 1724 in the Prussian city of Königsberg (now Kaliningrad in Russia). His parents – Johann Georg and Anna Regina – were pietists. Although they raised Kant in this tradition (an austere offshoot of Lutheranism that emphasized humility and divine grace), he does not appear ever to have been very sympathetic to this kind of religious devotion. As a youth, he attended the Collegium Fridericianum in Königsberg, after which he attended the University of Königsberg. Although he initially focused his studies on the classics, philosophy soon caught and held his attention. The rationalism of Gottfried Leibniz (1646-1716) and Christian Wolff (1679-1754) was most influential on him during these early years, but Kant was also introduced to Isaac Newton’s (1642-1727) writings during this time. His mother had died in 1737, and after his father’s death in 1746 Kant left the University to work as a private tutor for several families in the countryside around the city. He returned to the University in 1754 to teach as a Privatdozent, which meant that he was paid directly by individual students, rather than by the University. He supported himself in this way until 1770. Kant published many essays and other short works during this period. He made minor scientific contributions in astronomy, physics, and earth science, and wrote philosophical treatises engaging with the Leibnizian-Wolffian traditions of the day (many of these are discussed below). Kant’s primary professional goal during this period was to eventually attain the position of Professor of Logic and Metaphysics at Königsberg. He finally succeeded in 1770 (at the age of 46) when he completed his second dissertation (the first had been published in 1755), which is now referred to as the Inaugural Dissertation. The 1780s would be the most productive years of Kant’s career. In addition to writing the Prolegomena to Any Future Metaphysics (1783) as a sort of introduction to the Critique, Kant wrote important works in ethics (Groundwork for the Metaphysics of Morals, 1785, and Critique of Practical Reason, 1788), he applied his theoretical philosophy to Newtonian physical theory (Metaphysical Foundations of Natural Science, 1786), and he substantially revised the Critique of Pure Reason in 1787. Kant capped the decade with the publication of the third and final critique, Critique of the Power of Judgment (1790). Although the products of the 1780s are the works for which Kant is best known, he continued to publish philosophical writings through the 1790s as well. Of note during this period are Religion within the Bounds of Mere Reason (1793), Towards Perpetual Peace (1795), Metaphysics of Morals (1797), and Anthropology from a Pragmatic Point of View (1798). The Religion was attended with some controversy, and Kant was ultimately led to promise the King of Prussia (Friedrich Wilhelm II) not to publish anything else on religion. (Kant considered the promise null and void after the king died in 1797.) During his final years, he devoted himself to completing the critical project with one final bridge to physical science. Unfortunately, the encroaching dementia of Kant’s final years prevented him from completing this book (partial drafts are published under the title Opus Postumum). The most important element of Kant’s mature metaphysics and epistemology is his doctrine of transcendental idealism, which received its fullest discussion in Critique of Pure Reason (1781/87). Transcendental idealism is the thesis that the empirical world that we experience (the “phenomenal” world of “appearances”) is to be distinguished from the world of things as they are in themselves. The most significant aspect of this distinction is that while the empirical world exists in space and time, things in themselves are neither spatial nor temporal. Transcendental idealism has wide-ranging consequences. On the positive side, Kant takes transcendental idealism to entail an “empirical realism,” according to which humans have direct epistemic access to the natural, physical world and can even have a priori cognition of basic features of all possible experienceable objects. On the negative side, Kant argues that we cannot have knowledge of things in themselves. Further, since traditional metaphysics deals with things in themselves, answers to the questions of traditional metaphysics (for example, regarding God or free will) can never be answered by human minds. This section addresses the development of Kant’s metaphysics and epistemology and then summarizes the most important arguments and conclusions of Kant’s theory. Critique of Pure Reason, the book that would alter the course of western philosophy, was written by a man already far into his career. Unlike the later “critical period” Kant, the philosophical output of the early Kant was fully enmeshed in the German rationalist tradition, which was dominated at the time by the writings of Gottfried Leibniz (1646-1716) and Christian Wolff (1679-1754). Nevertheless, many of Kant’s concerns during the pre-critical period anticipate important aspects of his mature thought. Kant’s first purely philosophical work was the New Elucidation of the First Principles of Metaphysical Cognition (1755). The first parts of this long essay present criticisms and revisions of the Wolffian understanding of the basic principles of metaphysics, especially the Principles of Identity (whatever is, is, and whatever is not, is not), of Contradiction (nothing can both be and not be), and of Sufficient Reason (nothing is true without a reason why it is true). In the final part, Kant defends two original principles of metaphysics. According to the “Principle of Succession,” all change in objects requires the mutual interaction of a plurality of substances. This principle is a metaphysical analogue of Newton’s principle of action and reaction, and it anticipates Kant’s argument in the Third Analogy of Experience from Critique of Pure Reason (see 2f below). According to the “Principle of Coexistence,” multiple substances can only be said to coexist within the same world if the unity of that world is grounded in the intellect of God. Although Kant would later claim that we can never have metaphysical cognition of this sort of relation between God and the world (not least of all because we can’t even know that God exists), he would nonetheless continue to be occupied with the question of how multiple distinct substances can constitute a single, unified world. In the Physical Monadology (1756), Kant attempts to provide a metaphysical account of the basic constitution of material substance in terms of “monads.” Leibniz and Wolff had held that monads are the simple, atomic substances that constitute matter. Kant follows Wolff in rejecting Leibniz’s claim that monads are mindlike and that they do not interact with each other. The novel aspect of Kant’s account lies in his claim that each monad possesses a degree of both attractive and repulsive force, and that monads fill determinate volumes of space because of the interactions between these monads as they compress each other through their opposed repulsive forces. Thirty years later, in the Metaphysical Foundations of Natural Science (1786), Kant would develop the theory that matter must be understood in terms of interacting attractive and repulsive forces. The primary difference between the later view and the earlier is that Kant no longer appeals to monads, or simple substances at all (transcendental idealism rules out the possibility of simplest substances as constituents of matter; see 2gii below). The final publication of Kant’s pre-critical period was On the Form and Principles of the Sensible and the Intelligible World, also referred to as the Inaugural Dissertation (1770), since it marked Kant’s appointment as Königsberg’s Professor of Logic and Metaphysics. Although Kant had not yet had the final crucial insights that would lead to the development of transcendental idealism, many of the important elements of his mature metaphysics are prefigured here. Two aspects of the Inaugural Dissertation are especially worth noting. First, in a break from his predecessors, Kant distinguishes two fundamental faculties of the mind: sensibility, which represents the world through singular “intuitions,” and understanding, which represents the world through general “concepts.” In the Inaugural Dissertation, Kant argues that sensibility represents the sensible world of “phenomena” while the understanding represents an intelligible world of “noumena.” The critical period Kant will deny that we can have any determinate knowledge of noumena, and that knowledge of phenomena requires the cooperation of sensibility and understanding together. Second, in describing the “form” of the sensible world, Kant argues that space and time are “not something objective and real,” but are rather “subjective and ideal” (2:403). The claim that space and time pertain to things only as they appear, not as they are in themselves, will be one of the central theses of Kant’s mature transcendental idealism. Although the early Kant showed a complete willingness to dissent from many important aspects of the Wolffian orthodoxy of the time, Kant continued to take for granted the basic rationalist assumption that metaphysical cognition was possible. In a retrospective remark from the Prolegomena to Any Future Metaphysics (1783), Kant says that his faith in this rationalist assumption was shaken by David Hume (1711-1776), whose skepticism regarding the possibility of knowledge of causal necessary connections awoke Kant from his “dogmatic slumber” (4:260). Hume argued that we can never have knowledge of necessary connections between causes and effects because such knowledge can neither be given through the senses, nor derived a priori as conceptual truths. Kant realized that Hume’s problem was a serious one because his skepticism about knowledge of the necessity of the connection between cause and effect generalized to all metaphysical knowledge pertaining to necessity, not just causation specifically. For instance, there is the question why mathematical truths necessarily hold true in the natural world, or the question whether we can know that a being (God) exists necessarily. The solution to Hume’s skepticism, which would form the basis of the critical philosophy, was twofold. The first part of Kant’s solution was to agree with Hume that metaphysical knowledge (such as knowledge of causation) is neither given through the senses, nor is it known a priori through conceptual analysis. Kant argued, however, that there is a third kind of knowledge which is a priori, yet which is not known simply by analyzing concepts. He referred to this as “synthetic a priori knowledge.” Where analytic judgments are justified by the semantic relations between the concepts they mention (for example, “all bachelors are unmarried”), synthetic judgments are justified by their conformity to the given object that they describe (for example, “this ball right here is red”). The puzzle posed by the notion of synthetic a priori knowledge is that it would require that an object be presented to the mind, but not be given in sensory experience. The second part of Kant’s solution is to explain how synthetic a priori knowledge could be possible. He describes his key insight on this matter as a “Copernican” shift in his thinking about the epistemic relation between the mind and the world. Copernicus had realized that it only appeared as though the sun and stars revolved around us, and that we could have knowledge of the way the solar system really was if we took into account the fact that the sky looks the way it does because we perceivers are moving. Analogously, Kant realized that we must reject the belief that the way things appear corresponds to the way things are in themselves. Furthermore, he argued that the objects of knowledge can only ever be things as they appear, not as they are in themselves. Appealing to this new approach to metaphysics and epistemology, Kant argued that we must investigate the most basic structures of experience (that is, the structures of the way things appear to us), because the basic structures of experience will coincide with the basic structures of any objects that could possibly be experienced. In other words, if it is only possible to have experience of an object if the object conforms to the conditions of experience, then knowing the conditions of experience will give us knowledge – synthetic a priori knowledge in fact – of every possible object of experience. Kant overcomes Hume’s skepticism by showing that we can have synthetic a priori knowledge of objects in general when we take as the object of our investigation the very form of a possible object of experience. Critique of Pure Reason is an attempt to work through all of the important details of this basic philosophical strategy. Kant’s theory of the mind is organized around an account of the mind’s powers, its “cognitive faculties.” One of Kant’s central claims is that the cognitive capacities of the mind depend on two basic and fundamentally distinct faculties. First, there is “sensibility.” Sensibility is a passive faculty because its job is to receive representations through the affection of objects on the senses. Through sensibility, objects are “given” to the mind. Second, there is “understanding,” which is an active faculty whose job is to “think” (that is, apply concepts to) the objects given through sensibility. The most basic type of representation of sensibility is what Kant calls an “intuition.” An intuition is a representation that refers directly to a singular individual object. There are two types of intuitions. Pure intuitions are a priori representations of space and time themselves (see 2d1 below). Empirical intuitions are a posteriori representations that refer to specific empirical objects in the world. In addition to possessing a spatiotemporal “form,” empirical intuitions also involve sensation, which Kant calls the “matter” of intuition (and of experience generally). (Without sensations, the mind could never have thoughts about real things, only possible ones.) We have empirical intuitions both of objects in the physical world (“outer intuitions”) and objects in our own minds (“inner intuitions”). The most basic type of representation of understanding is the “concept.” Unlike an intuition, a concept is a representation that refers generally to indefinitely many objects. (For instance, the concept ‘cat’ on its own could refer to any and all cats, but not to any one in particular.) Concepts refer to their objects only indirectly because they depend on intuitions for reference to particular objects. As with intuitions, there are two basic types of concepts. Pure concepts are a priori representations and they characterize the most basic logical structure of the mind. Kant calls these concepts “categories.” Empirical concepts are a posteriori representations, and they are formed on the basis of sensory experience with the world. Concepts are combined by the understanding into “judgments,” which are the smallest units of knowledge. I can only have full cognition of an object in the world once I have, first, had an empirical intuition of the object, second, conceptualized this object in some way, and third, formed my conceptualization of the intuited object into a judgment. This means that both sensibility and understanding must work in cooperation for knowledge to be possible. As Kant expresses it, “Thoughts without content are empty, intuitions without concepts are blind” (A51/B75). There are two other important cognitive faculties that must be mentioned. The first is transcendental “imagination,” which mediates between sensibility and understanding. Kant calls this faculty “blind” because we do not have introspective access to its operations. Kant says that we can at least know that it is responsible for forming intuitions in such a way that it is possible for the understanding to apply concepts to them. The other is “reason,” which operates in a way similar to the understanding, but which operates independently of the senses. While understanding combines the data of the senses into judgments, reason combines understanding’s judgments together into one coherent, unified, systematic whole. Reason is not satisfied with mere disconnected bits of knowledge. Reason wants all knowledge to form a system of knowledge. Reason is also the faculty responsible for the “illusions” of transcendent metaphysics (see 2g below). Transcendental idealism is a theory about the relation between the mind and its objects. Three fundamental theses make up this theory: first, there is a distinction between appearances (things as they appear) and things as they are in themselves. Second, space and time are a priori, subjective conditions on the possibility of experience, and hence they pertain only to appearances, not to things in themselves. Third, we can have determinate cognition of only of things that can be experienced, hence only of appearances, not things in themselves. A quick remark on the term “transcendental idealism” is in order. Kant typically uses the term “transcendental” when he wants to emphasize that something is a condition on the possibility of experience. So for instance, the chapter titled “Transcendental Analytic of Concepts” deals with the concepts without which cognition of an object would be impossible. Kant uses the term “idealism” to indicate that the objects of experience are mind-dependent (although the precise sense of this mind-dependence is controversial; see 2d2 below). Hence, transcendental idealism is the theory that it is a condition on the possibility of experience that the objects of experience be in some sense mind-dependent. Kant argues that space and time are a priori, subjective conditions on the possibility of experience, that is, that they are transcendentally ideal. Kant grounds the distinction between appearances and things in themselves on the realization that, as subjective conditions on experience, space and time could only characterize things as they appear, not as they are in themselves. Further, the claim that we can only know appearances (not things in themselves) is a consequence of the claims that we can only know objects that conform to the conditions of experience, and that only spatiotemporal appearances conform to these conditions. Given the systematic importance of this radical claim, what were Kant’s arguments for it? What follows are some of Kant’s most important arguments for the thesis. One argument has to do with the relation between sensations and space. Kant argues that sensations on their own are not spatial, but that they (or arguably the objects they correspond to) are represented in space, “outside and next to one another” (A23/B34). Hence, the ability to sense objects in space presupposes the a priori representation of space, which entails that space is merely ideal, hence not a property of things in themselves. Many commentators have found these arguments less than satisfying because they depend on the questionable assumption that if the representations of space and time are a priori they thereby cannot be properties of things in themselves. “Why can’t it be both?” many want to ask. A stronger argument appears in Kant’s discussion of the First and Second Antinomies of Pure Reason (discussed below, 2g2). There Kant argues that if space and time were things in themselves or even properties of things in themselves, then one could prove that space and time both are and are not infinitely large, and that matter in space both is and is not infinitely divisible. In other words, the assumption that space and time are transcendentally real instead of transcendentally ideal leads to a contradiction, and thus space and time must be transcendentally ideal. How Kant’s distinction between appearances and things in themselves should be understood is one of the most controversial topics in the literature. It is a question of central importance because how one understands this distinction determines how one will understand the entire nature of Kantian idealism. The following briefly summarizes the main interpretive options, but it does not take a stand on which is correct. According to “two-world” interpretations, the distinction between appearances and things in themselves is to be understood in metaphysical and ontological terms. Appearances (and hence the entire physical world that we experience) comprise one set of entities, and things in themselves are an ontologically distinct set of entities. Although things in themselves may somehow cause us to have experience of appearances, the appearances we experience are not things in themselves. A common objection against two-world interpretations is that they may make Kant’s theory too similar to Berkeley’s immaterialist idealism (an association from which Kant vehemently tried to distance himself), and they seem to ignore Kant’s frequent characterization of the appearance/thing in itself distinction in terms of different epistemic standpoints. And a common objection against one-world interpretations is that they may trivialize some of the otherwise revolutionary aspects of Kant’s theory, and they seem to ignore Kant’s frequent characterization of the appearance/thing in itself distinction in seemingly metaphysical terms. There have been attempts at interpretations that are intermediate between these two options. For instance, some have argued that Kant only acknowledges one world, but that the appearance/thing in itself distinction is nevertheless metaphysical, not merely epistemological. The task of the chapter titled “Transcendental Deduction of the Categories” is to show that these categories can and must be applied in some way to any object that could possibly be an object of experience. The argument of the Transcendental Deduction is one of the most important moments in the Critique, but it is also one of the most difficult, complex, and controversial arguments in the book. Hence, it will not be possible to reconstruct the argument in any detail here. Instead, Kant’s most important claims and moves in the Deduction are described. Kant’s argument turns on conceptions of self-consciousness (or what he calls “apperception”) as a condition on the possibility of experiencing the world as a unified whole. Kant takes it to be uncontroversial that we can be aware of our representations as our representations. It is not just that I can have the thoughts ‘P’ or ‘Q’; I am also always able to ascribe these thoughts to myself: ‘I think P’ and ‘I think Q’. Further, we are also able to recognize that it is the same I that does the thinking in both cases. Thus, we can recognize that ‘I think both P and Q’. In general, all of our experience is unified because it can be ascribed to the one and same I, and so this unity of experience depends on the unity of the self-conscious I. Kant next asks what conditions must obtain in order for this unity of self-consciousness to be possible. His answer is that we must be able to differentiate between the I that does the thinking and the object that we think about. That is, we must be able to distinguish between subjective and objective elements in our experience. If we could not make such a distinction, then all experience would just be so many disconnected mental happenings: everything would be subjective and there would be no “unity of apperception” that stands over and against the various objects represented by the I. So next Kant needs to explain how we are able to differentiate between the subjective and objective elements of experience. His answer is that a representation is objective when the subject is necessitated in representing the object in a certain way, that is, when it is not up to the free associative powers of my imagination to determine how I represent it. For instance, whether I think a painting is attractive or whether it calls to mind an instance from childhood depends on the associative activity of my own imagination; but the size of the canvas and the chemical composition of the pigments is not up to me: insofar as I represent these as objective features of the painting, I am necessitated in representing them in a certain way. In order for a representational content to be necessitated in this way, according to Kant, is for it to be subject to a “rule.” The relevant rules that Kant has in mind are the conditions something must satisfy in order for it to be represented as an object at all. And these conditions are precisely the concepts laid down in the schema of the categories, which are the concepts of an “object in general.” Hence, if I am to have experience at all, I must conceptualize objects in terms of the a priori categories. Kant’s argument in the Deduction is a “transcendental argument”: Kant begins with a premise accepted by everyone, but then asks what conditions must have been met in order for this premise to be true. Kant assumed that we have a unified experience of the many objects populating the world. This unified experience depends on the unity of apperception. The unity of apperception enables the subject to distinguish between subjective and objective elements in experience. This ability, in turn, depends on representing objects in accordance with rules, and the rules in question are the categories. Hence, the only way we can explain the fact that we have experience at all is by appeal to the fact that the categories apply to the objects of experience. It is worth emphasizing how truly radical the conclusion of the Transcendental Deduction is. Kant takes himself to have shown that all of nature is subject to the rules laid down by the categories. But these categories are a priori: they originate in the mind. This means that the order and regularity we encounter in the natural world is made possible by the mind’s own construction of nature and its order. Thus the conclusion of the Transcendental Deduction parallels the conclusion of the Transcendental Aesthetic: where the latter had shown that the forms of sensibility (space and time) originate in the mind and are imposed on the world, the former shows that the forms of understanding (the categories) also originate in the mind and are imposed on the world. The Transcendental Deduction showed that it is necessary for us to make use of the categories in experience, but also that we are justified in making use of them. In the following series of chapters (together labeled the Analytic of Principles) Kant attempts to leverage the results of the Deduction and prove that there are transcendentally necessary laws that every possible object of experience must obey. He refers to these as “principles of pure understanding.” These principles are synthetic a priori in the sense defined above (see 2b), and they are transcendental conditions on the possibility of experience. The first two principles correspond to the categories of quantity and quality. First, Kant argues that every object of experience must have a determinate spatial shape and size and a determinate temporal duration (except mental objects, which have no spatial determinations). Second, Kant argues that every object of experience must contain a “matter” that fills out the object’s extensive magnitude. This matter must be describable as an “intensive magnitude.” Extensive magnitudes are represented through the intuition of the object (the form of the representation) and intensive magnitudes are represented by the sensations that fill out the intuition (the matter of the representation). The next three principles are discussed in an important, lengthy chapter called the Analogies of Experience. They derive from the relational categories: substance, causality, and community. According to the First Analogy, experience will always involve objects that must be represented as substances. “Substance” here is to be understood in terms of an object that persists permanently as a “substratum” and which is the bearer of impermanent “accidents.” According to the Second Analogy, every event must have a cause. One event is said to be the cause of another when the second event follows the first in accordance with a rule. And according to the Third Analogy (which presupposes the first two), all substances stand in relations of reciprocal interaction with each other. That is, any two pieces of material substance will effect some degree of causal influence on each other, even if they are far apart. The principles of the Analogies of Experience are important metaphysical principles, and if Kant’s arguments for them are successful, they mark significant advances in the metaphysical investigation of nature. The First Analogy is a form of the principle of the conservation of matter: it shows that matter can never be created or annihilated by natural means, it can only be altered. The Second Analogy is a version of the principle of sufficient reason applied to experience (causes being sufficient reasons for their effects), and it represents Kant’s refutation of Hume’s skepticism regarding causation. Hume had argued that we can never have knowledge of necessary connections between events; rather, we can only perceive certain types of events to be constantly conjoined with other types of events. In arguing that events follow each other in accordance with rules, Kant has shown how we can have knowledge of necessary connections between events above and beyond their mere constant conjunction. Lastly, Kant probably intended the Third Analogy to establish a transcendental, a priori basis for something like Newton’s law of universal gravitation, which says that no matter how far apart two objects are they will exert some degree of gravitational influence on each other. The Postulates of Empirical Thinking in General contains the final set of principles of pure understanding and they derive from the modal categories (possibility, actuality, necessity). The Postulates define the different ways to represent the modal status of objects, that is, what it is for an object of experience to be possible, actual, or necessary. The most important passage from the Postulates chapter is the Refutation of Idealism, which is a refutation of external world skepticism that Kant added to the 1787 edition of the Critique. Kant had been annoyed by reviews of the first edition that unfavorably compared his transcendental idealism with Berkeley’s immaterialist idealism. In the Refutation, Kant argues that his system entails not just that an external (that is, spatial) world is possible (which Berkeley denied), but that we can know it is real (which Descartes and others questioned). Kant’s argumentative strategy in the Refutation is ingenious but controversial. Where the skeptics assume that we have knowledge of the states of our own minds, but say that we cannot be certain that an external world corresponds to these states, Kant turns the tables and argues that we would not have knowledge of the states of our own minds (specifically, the temporal order in which our ideas occur) if we were not simultaneously aware of permanent substances in space, outside of the mind. The precise structure of Kant’s argument, as well as the question how successful it is, continues to be a matter of heated debate in the literature. Kant presents his analysis of transcendental illusion and his critique of transcendent metaphysics in the series of chapters titled “Transcendental Dialectic,” which takes up the majority of the second half of Critique of Pure Reason. This section summarizes Kant’s most important arguments from the Dialectic. Kant addresses the metaphysics of the soul – an inquiry he refers to as “rational psychology” – in the Paralogisms of Pure Reason. Rational psychology, as Kant describes it, is the attempt to prove metaphysical theses about the nature of the soul through an analysis of the simple proposition, “I think.” Many of Kant’s rationalist predecessors and contemporaries had thought that reflection on the notion of the “I” in the proposition “I think” would reveal that the I is necessarily a substance (which would mean that the I is a soul), an indivisible unity (which some would use to prove the immortality of the soul), self-identical (which is relevant to questions regarding personal identity), and distinct from the external world (which can lead to external-world skepticism). Kant argues that such reasoning is the result of transcendental illusion. Transcendental illusion in rational psychology arises when the mere thought of the I in the proposition “I think” is mistaken for a cognition of the I as an object. (A cognition involves both intuition and concept, while a mere thought involves only concept.) For instance, consider the question whether we can cognize the I as a substance (that is, as a soul). On the one hand, something is cognized as a substance when it is represented only as the subject of predication and is never itself the predicate of some other subject. The I of “I think” is always represented as subject (the I’s various thoughts are its predicates). On the other hand, something can only be cognized as a substance when it is given as a persistent object in an intuition (see 2f above), and there can be no intuition of the I itself. Hence although we cannot help but think of the I as a substantial soul, we can never have cognition of the I as a substance, and hence knowledge of the existence and nature of the soul is impossible. The Antinomies of Pure Reason deal with “rational cosmology,” that is, with metaphysical inquiry into the nature of the cosmos considered as a totality. An “antinomy” is a conflict of reason with itself. Antinomies arise when reason seems to be able to prove two opposed and mutually contradictory propositions with apparent certainty. Kant discusses four antinomies in the first Critique (he uncovers other antinomies in later writings as well). The First Antinomy shows that reason seems to be able to prove that the universe is both finite and infinite in space and time. The Second Antinomy shows that reason seems to be able to prove that matter both is and is not infinitely divisible into ever smaller parts. The Third Antinomy shows that reason seems to be able to prove that free will cannot be a causally efficacious part of the world (because all of nature is deterministic) and yet that it must be such a cause. And the Fourth Antinomy shows that reason seems to be able to prove that there is and there is not a necessary being (which some would identify with God). In all four cases, Kant attempts to resolve these conflicts of reason with itself by appeal to transcendental idealism. The claim that space and time are not features of things in themselves is used to resolve the First and Second Antinomies. Since the empirical world in space and time is identified with appearances, and since the world as a totality can never itself be given as a single appearance, there is no determinate fact of the matter regarding the size of the universe: It is neither determinately finite nor determinately infinite; rather, it is indefinitely large. Similarly, matter has neither simplest atoms (or “monads”) nor is it infinitely divided; rather, it is indefinitely divisible. The distinction between appearances and things in themselves is used to resolve the Third and Fourth Antinomies. Although every empirical event experienced within the realm of appearance has a deterministic natural cause, it is at least logically possible that freedom can be a causally efficacious power at the level of things in themselves. And although every empirical object experienced within the realm of appearance is a contingently existing entity, it is logically possible that there is a necessary being outside the realm of appearance which grounds the existence of the contingent beings within the realm of appearance. It must be kept in mind that Kant has not claimed to demonstrate the existence of a transcendent free will or a transcendent necessary being: Kant denies the possibility of knowledge of things in themselves. Instead, Kant only takes himself to have shown that the existence of such entities is logically possible. In his moral theory, however, Kant will offer an argument for the actuality of freedom (see 5c below). The Ideal of Pure Reason addresses the idea of God and argues that it is impossible to prove the existence of God. The argumentation in the Ideal of Pure Reason was anticipated in Kant’s The Only Possible Argument in Support of the Existence of God (1763), making this aspect of Kant’s mature thought one of the most significant remnants of the pre-critical period. Kant identifies the idea of God with the idea of an ens realissimum, or “most real being.” This most real being is also considered by reason to be a necessary being, that is, something which exists necessarily instead of merely contingently. Reason is led to posit the idea of such a being when it reflects on its conceptions of finite beings with limited reality and infers that the reality of finite beings must derive from and depend on the reality of the most infinitely perfect being. Of course, the fact that reason necessarily thinks of a most real, necessary being does not entail that such a being exists. Kant argues that there are only three possible arguments for the existence of such a being, and that none is successful. According to the ontological argument for the existence of God (versions of which were proposed by St. Anselm (1033-1109) and Descartes (1596-1650), among others), God is the only being whose essence entails its existence. Kant famously objects that this argument mistakenly treats existence as a “real predicate.” According to Kant, when I make an assertion of the form “x is necessarily F,” all I can mean is that “if x exists, then x must be F.” Thus when proponents of the ontological argument claim that the idea of God entails that “God necessarily exists,” all they can mean is that “if God exists, then God exists,” which is an empty tautology. Kant also offers lengthy criticisms of the cosmological argument (the existence of contingent beings entails the existence of a necessary being) and the physico-theological argument, which is also referred to as the “argument from design” (the order and purposiveness in the empirical world can only be explained by a divine creator). Kant argues that both of these implicitly depend on the argumentation of the ontological argument pertaining to necessary existence, and since it fails, they fail as well. Although Kant argues in the Transcendental Dialectic that we cannot have cognition of the soul, of freedom of the will, nor of God, in his ethical writings he will complicate this story and argue that we are justified in believing in these things (see 5c below). The distinction between analytic and synthetic judgments (see 2b above) is necessary for understanding Kant’s theory of mathematics. Recall that an analytic judgment is one where the truth of the judgment depends only on the relation between the concepts used in the judgment. The truth of a synthetic judgment, by contrast, requires that an object be “given” in sensibility and that the concepts used in the judgment be combined in the object. In these terms, most of Kant’s predecessors took mathematical truths to be analytic truths. Kant, by contrast argued that mathematical knowledge is synthetic. It may seem surprising that one’s knowledge of mathematical truths depends on an object being given in sensibility, for we surely don’t arrive at mathematical knowledge by empirical means. Recall, however, that a judgment can be both synthetic yet a priori. Like the judgments of the necessary structures of experience, mathematics is also synthetic a priori according to Kant. To make this point, Kant considers the proposition ‘7+5=12’. Surely, this proposition is a priori: I can know its truth without doing empirical experiments to see what happens when I put seven things next to five other things. More to the point, ‘7+5=12’ must be a priori because it is a necessary truth, and empirical judgments are always merely contingent according to Kant. Yet at the same time, the judgment is not analytic because, “The concept of twelve is by no means already thought merely by my thinking of that unification of seven and five, and no matter how long I analyze my concept of such a possible sum I will still not find twelve in it” (B15). If mathematical knowledge is synthetic, then it depends on objects being given in sensibility. And if it is a priori, then these objects must be non-empirical objects. What sort of objects does Kant have in mind here? The answer lies in Kant’s theory of the pure forms of intuition (space and time). Recall that an intuition is a singular, immediate representation of an individual object (see 2c above). Empirical intuitions represent sensible objects through sensation, but pure intuitions are a priori representations of space and time as such. These pure intuitions of space and time provide the objects of mathematics through what Kant calls a “construction” of concepts in pure intuition. As he puts it, “to construct a concept means to exhibit a priori the intuition corresponding to it” (A713/B741). A mathematical concept (for example, ‘triangle’) can be thought of as a rule for how to make an object that corresponds to that concept. Thus if ‘triangle’ is defined as ‘three-sided, two-dimensional shape’, then I construct a triangle in pure intuition when I imagine three lines coming together to form a two-dimensional figure. These pure constructions in intuition can be used to arrive at (synthetic, a priori) mathematical knowledge. Consider the proposition, ‘The angles of a triangle sum to 180 degrees’. When I construct a triangle in intuition in accordance with the rule ‘three-sided, two-dimensional shape’, then the constructed triangle will in fact have angles that sum to 180 degrees. And this will be true irrespective of what particular triangle I constructed (isosceles, scalene, and so forth.). Kant holds that all mathematical knowledge is derived in this fashion: I take a concept, construct it in pure intuition, and then determine what features of the constructed intuition are necessarily true of it. In addition to his work in pure theoretical philosophy, Kant displayed an active interest in the natural sciences throughout his career. Most of his important scientific contributions were in the physical sciences (including not just physics proper, but also earth sciences and cosmology). In Critique of the Power of Judgment (1790) he also presented a lengthy discussion of the philosophical basis of the study of biological entities. In general, Kant thought that a body of knowledge could only count as a science in the true sense if it could admit of mathematical description and an a priori principle that could be “presented a priori in intuition” (4:471). Hence, Kant was pessimistic about the possibility of empirical psychology ever amounting to a true science. Kant even thought it might be the case that “chemistry can be nothing more than a systematic art or experimental doctrine, but never a proper science” (4:471). This section focuses primarily on Kant’s physics (4a), but it also lists several of Kant’s other scientific contributions (4b). Kant’s mature physical theory is presented in its fullest form in Metaphysical Foundations of Natural Science (1786). This theory can be understood as an outgrowth and consequence of the transcendental theory of experience articulated in Critique of Pure Reason (see 2f above). Where the Critique had shown the necessary conceptual forms to which all possible objects of experience must conform, the Metaphysical Foundations specifies in greater detail what exactly the physical constitution of these objects must be like. The continuity with the theory of experience from the Critique is implicit in the very structure of the Metaphysical Foundations. Just as Kant’s theory of experience was divided into four sections corresponding to the four groups of categories (quantity, quality, relation, modality), the body of the Metaphysical Foundations is also divided along the same lines. Like the theory of the Physical Monadology, the Metaphysical Foundations presents a “dynamical” theory of matter according to which material substance is constituted by an interaction between attractive and repulsive forces. The basic idea is that each volume of material substance possesses a brute tendency to expand and push away other volumes of substance (this is repulsive force) and each volume of substance possesses a brute tendency to contract and to attract other volumes of substance (this is attractive force). The repulsive force explains the solidity and impenetrability of bodies while the attractive force explains gravitation (and presumably also phenomena such as magnetic attraction). Further, any given volume of substance will possess these forces to a determinate degree: the matter in a volume can be more or less repulsive and more or less attractive. The ratio of attractive and repulsive force in a substance will determine how dense the body is. In this respect, Kant’s theory marks a sharp break from those of his mechanist predecessors. (Mechanists believed that all physical phenomena could be explained by appeal to the sizes, shapes, and velocities of material bodies.) The Cartesians thought that there is no true difference in density and that the appearance of differences in density could be explained by appeal to porosity in the body. Similarly, the atomists thought that density could be explained by differences in the ratio of atoms to void in any given volume. Thus for both of these theories, any time there was a volume completely filled in with material substance (no pores, no void), there could only be one possible value for mass divided by volume. According to Kant’s theory, by contrast, two volumes of equal size could be completely filled in with matter and yet differ in their quantity of matter (their mass), and hence differ in their density (mass divided by volume). Another consequence of Kant’s theory that puts him at odds with the Cartesians and atomists was his claim that matter is elastic, hence compressible: a completely filled volume of matter could be reduced in volume while the quantity of matter remained unchanged (hence it would become denser). The Cartesians and atomists took this to be impossible. 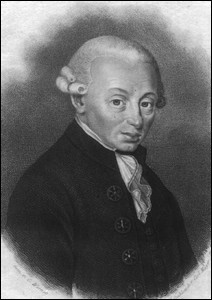 At the end of his career, Kant worked on a project that was supposed to complete the connection between the transcendental philosophy and physics. Among other things, Kant attempted to give a transcendental, a priori demonstration of the existence of a ubiquitous “ether” that permeates all of space. Although Kant never completed a manuscript for this project (due primarily to the deterioration of his mental faculties at the end of his life), he did leave behind many notes and partial drafts. Many of these notes and drafts have been edited and published under the title Opus Postumum. In addition to his major contributions to physics, Kant published various writings addressing different issues in the natural sciences. Early on he showed a great deal of interest in geology and earth science, as evidenced by the titles of some of his shorter essays: The question, Whether the Earth is Ageing, Considered from a Physical Point of View (1754); On the Causes of Earthquakes on the Occasion of the Calamity that Befell the Western Countries of Europe Towards the End of Last Year (1756); Continued Observations on the Earthquakes that Have been Experienced for Some Time (1756); New Notes to Explain the Theory of the Winds, in which, at the Same Time, He Invites Attendance to his Lectures (1756). In 1755, he wrote the Succinct Exposition of Some Meditations on Fire (which he submitted to the university as a Master’s Thesis). There he argued, against the Cartesian mechanists, that physical phenomena such as fire can only be explained by appeal to elastic (that is, compressible) matter, which anticipated the mature physics of his Metaphysical Foundations (see 4a above). One of Kant’s most lasting scientific contributions came from his early work in cosmology. In his Universal Natural History and Theory of the Heavens (1755), Kant gave a mechanical explanation of the formation of the solar system and the galaxies in terms of the principles of Newtonian physics. (A shorter version of the argument also appears in The Only Possible Argument in Support of a Demonstration of the Existence of God from 1763.) Kant’s hypothesis was that a single mechanical process could explain why we observe an orbital motion of smaller bodies around larger ones at many different scales in the cosmos (moons around planets, planets around stars, and stars around the center of the galaxy). He proposed that at the beginning of creation, all matter was spread out more or less evenly and randomly in a kind of nebula. Since the various bits of matter all attracted each other through gravitation, bodies would move towards each other within local regions to form larger bodies. The largest of these became stars, and the smaller ones became moons or planets. Because everything was already in motion (due to the gravitational attraction of everything to everything), and because all objects would be pulled towards the center of mass of their local region (for example, the sun at the center of the solar system, or a planet at the center of its own smaller planetary system), the motion of objects within that region would become orbital motions (as described by Newton’s theory of gravity). Although the Universal Natural History was not widely read for most of Kant’s lifetime (due primarily to Kant’s publisher going bankrupt while the printed books remained in a warehouse), in 1796 Pierre-Simon Laplace (1749-1827) proposed a remarkably similar version of the same theory, and this caused renewed interest in Kant’s book. Today the theory is referred to as the “Kant-Laplace Nebular Hypothesis,” and a modified version of this theory is still held today. Finally, in the second half of Critique of the Power of Judgment (1790), Kant discusses the philosophical foundations of biology by way of an analysis of teleological judgments. While in no way a fully worked out biological theory per se, Kant connects his account of biological cognition in interesting ways to other important aspects of his philosophical system. First, natural organisms are essentially teleological, or “purposive.” This purposiveness is manifested through the organic structure of the organism: its many parts all work together to constitute the whole, and any one part only makes sense in terms of its relation to the healthy functioning of the whole. For instance, the teeth of an animal are designed to chew the kind of food that the animal is equipped to hunt or forage and that it is suited to digest. In this respect, biological entities bear a strong analogy to great works of art. Great works of art are also organic insofar as the parts only make sense in the context of the whole, and art displays a purposiveness similar to that found in nature (see section 7 below). Second, Kant discusses the importance of biology with respect to theological cognition. While he denies that the apparent design behind the purposiveness of organisms can be used as a proof for God’s existence (see 2g3 above), he does think that the purposiveness found in nature provides a sort of hint that there is an intelligible principle behind the observable, natural world, and hence that the ultimate purpose of all of nature is a rational one. In connection with his moral theory and theory of human history (see sections 5 and 6 below), Kant will argue that the teleology of nature can be understood as ultimately directed towards a culmination in a fully rational nature, that is, humanity in its (future) final form. Kant’s moral theory is organized around the idea that to act morally and to act in accordance with reason are one and the same. In virtue of being a rational agent (that is, in virtue of possessing practical reason, reason which is interested and goal-directed), one is obligated to follow the moral law that practical reason prescribes. To do otherwise is to act irrationally. Because Kant places his emphasis on the duty that comes with being a rational agent who is cognizant of the moral law, Kant’s theory is considered a form of deontology (deon- comes from the Greek for “duty” or “obligation”). Like his theoretical philosophy, Kant’s practical philosophy is a priori, formal, and universal: the moral law is derived non-empirically from the very structure of practical reason itself (its form), and since all rational agents share the same practical reason, the moral law binds and obligates everyone equally. So what is this moral law that obligates all rational agents universally and a priori? The moral law is determined by what Kant refers to as the Categorical Imperative, which is the general principle that demands that one respect the humanity in oneself and in others, that one not make an exception for oneself when deliberating about how to act, and in general that one only act in accordance with rules that everyone could and should obey. Although Kant insists that the moral law is equally binding for all rational agents, he also insists that the bindingness of the moral law is self-imposed: we autonomously prescribe the moral law to ourselves. Because Kant thinks that the kind of autonomy in question here is only possible under the presupposition of a transcendentally free basis of moral choice, the constraint that the moral law places on an agent is not only consistent with freedom of the will, it requires it. Hence, one of the most important aspects of Kant’s project is to show that we are justified in presupposing that our morally significant choices are grounded in a transcendental freedom (the very sort of freedom that Kant argued we could not prove through mere “theoretical” or “speculative” reason; see 2gii above). Kant lays out the case for his moral theory in Groundwork for the Metaphysics of Morals (1785), Critique of Practical Reason (also known as the “Second Critique”; 1788), and the Metaphysics of Morals (1797). His arguments from the Groundwork are his most well-known and influential, so the following focuses primarily on them. Kant begins his argument from the premise that a moral theory must be grounded in an account of what is unconditionally good. If something is merely conditionally good, that is, if its goodness depends on something else, then that other thing will either be merely conditionally good as well, in which case its goodness depends on yet another thing, or it will be unconditionally good. All goodness, then, must ultimately be traceable to something that is unconditionally good. There are many things that we typically think of as good but that are not truly unconditionally good. Beneficial resources such as money or power are often good, but since these things can be used for evil purposes, their goodness is conditional on the use to which they are put. Strength of character is generally a good thing, but again, if someone uses a strong character to successfully carry out evil plans, then the strong character is not good. Even happiness, according to Kant, is not unconditionally good. Although all humans universally desire to be happy, if someone is happy but does not deserve their happiness (because, for instance, their happiness results from stealing from the elderly), then it is not good for the person to be happy. Happiness is only good on the condition that the happiness is deserved. If a good will is one that forms its intentions on the basis of correct principles of action, then we want to know what sort of principles these are. A principle that commands an action is called an “imperative.” Most imperatives are “hypothetical imperatives,” that is, they are commands that hold only if certain conditions are met. For instance: “if you want to be a successful shopkeeper, then cultivate a reputation for honesty.” Since hypothetical imperatives are conditioned on desires and the intended consequences of actions, they cannot serve as the principles that determine the intentions and volitions of an unconditionally good will. Instead, we require what Kant calls a “categorical imperative.” Where hypothetical imperatives take the form, “if y is desired/intended/sought, do x,” categorical imperatives simply take the form, “do x.” Since a categorical imperative is stripped of all reference to the consequences of an action, it is thereby stripped of all determinate content, and hence it is purely formal. And since it is unconditional, it holds universally. Hence a categorical imperative expresses only the very form of a universally binding law: “nothing is left but the conformity of actions as such with universal law” (4:402). To act morally, then, is to form one’s intentions on the basis of the very idea of a universal principle of action. This conception of a categorical imperative leads Kant to his first official formulation of the categorical imperative itself: “act only in accordance with that maxim through which you can at the same time will that it become a universal law” (4:421). A maxim is a general rule that can be used to determine particular courses of actions in particular circumstances. For instance, the maxim “I shall lie when it will get me out of trouble” can be used to determine the decision to lie about an adulterous liaison. The categorical imperative offers a decision procedure for determining whether a given course of action is in accordance with the moral law. After determining what maxim one would be basing the action in question on, one then asks whether it would be possible, given the power (in an imagined, hypothetical scenario), to choose that everyone act in accordance with that same maxim. If it is possible to will that everyone act according to that maxim, then the action under consideration is morally permissible. If it is not possible to will that everyone act according to that maxim, the action is morally impermissible. Lying to cover up adultery is thus immoral because one cannot will that everyone act according to the maxim, “I shall lie when it will get me out of trouble.” Note that it is not simply that it would be undesirable for everyone to act according to that maxim. Rather, it would be impossible. Since everyone would know that everyone else was acting according to that maxim, there would never be the presupposition that anyone was telling the truth; the very act of lying, of course, requires such a presupposition on the part of the one being lied to. Hence, the state of affairs where everyone lies to get out of trouble can never arise, so it cannot be willed to be a universal law. It fails the test of the categorical imperative. Kant’s first formulation of the categorical imperative describes it in terms of the very form of universal law itself. This formal account abstracts from any specific content that the moral law might have for living, breathing human beings. Kant offers a second formulation to address the material side of the moral law. Since the moral law has to do with actions, and all actions are by definition teleological (that is, goal-directed), a material formulation of the categorical imperative will require an appeal to the “ends” of human activity. Some ends are merely instrumental, that is, they are sought only because they serve as “means” towards further ends. Kant argues that the moral law must be aimed at an end that is not merely instrumental, but is rather an end in itself. Only rational agents, according to Kant, are ends in themselves. To act morally is thus to respect rational agents as ends in themselves. Accordingly, the categorical imperative can be reformulated as follows: “So act that you use humanity, whether in your own person or in the person of any other, always at the same time as an end, never merely as a means” (4:429). The basic idea here is that it is immoral to treat someone as a thing of merely instrumental value; persons have an intrinsic (non-instrumental) value, and the moral law demands that we respect this intrinsic value. To return to the example of the previous paragraphs, it would be wrong to lie about an adulterous liaison because by withholding the truth one is manipulating the other person to make things easier for oneself; this sort of manipulation, however, amounts to treating the other as a thing (as a mere means to the comfort of not getting in trouble), and not as a person deserving of respect and entitled to the truth. The notion of a universal law provides the form of the categorical imperative and rational agents as ends in themselves provide the matter. These two sides of the categorical imperative are combined into yet a third formulation, which appeals to the notion of a “kingdom of ends.” A kingdom of ends can be thought of as a sort of perfectly just utopian ideal in which all citizens of this kingdom freely respect the intrinsic worth of the humanity in all others because of an autonomously self-imposed recognition of the bindingness of the universal moral law for all rational agents. The third formulation of the categorical imperative is simply the idea that one should act in whatever way a member of this perfectly just society would act: “act in accordance with the maxims of a member giving universal laws for a merely possible kingdom of ends” (4:439). The idea of a kingdom of ends is an ideal (hence the “merely possible”). Although humanity may never be able to achieve such a perfect state of utopian coexistence, we can at least strive to approximate this state to an ever greater degree. In the Groundwork, Kant suggests that the presupposition that we are free follows as a consequence of the fact that we have practical reason and that we think of ourselves as practical agents. Any time I face a choice that requires deliberation, I must consider the options before me as really open. If I thought of my course of action as already determined ahead of time, then there would not really be any choice to make. Furthermore, in taking my deliberation to be real, I also think of the possible outcomes of my actions as caused by me. The notion of a causality that originates in the self is the notion of a free will. So the very fact that I do deliberate about what actions I will take means that I am presupposing that my choice is real and hence that I am free. As Kant puts it, all practical agents act “under the idea of freedom” (4:448). It is not obvious that this argument is strong enough for Kant’s purposes. The position seems to be that I must act as though I am free, but acting as though I am free in no way entails that I really am free. At best, it seems that since I act as though I am free, I thereby must act as though morality really does obligate me. This does not establish that the moral law really does obligate me. In the Second Critique, Kant offers a different argument for the reality of freedom. He argues that it is a brute “fact of reason” (5:31) that the categorical imperative (and so morality generally) obligates us as rational agents. In other words, all rational agents are at least implicitly conscious of the bindingness of the moral law on us. Since morality requires freedom, it follows that if morality is real, then freedom must be real too. Thus this “fact of reason” allows for an inference to the reality of freedom. Although the conclusion of this argument is stronger than the earlier argument, its premise is more controversial. For instance, it is far from obvious that all rational agents are conscious of the moral law. If they were, how come no one discovered this exact moral law before 1785 when Kant wrote the Groundwork? Equally problematic, it is not clear why this “fact of reason” should count as knowledge of the bindingness of the moral law. It may just be that we cannot help but believe that the moral law obligates us, in which case we once again end up merely acting as though we are free and as though the moral law is real. Again, there is much debate in the literature about the structure and success of Kant’s arguments. It is clear, however, that the success of Kant’s moral project stands or falls with his arguments for freedom of the will, and that the overall strength of this theory is determined to a high degree by the epistemic status of our belief in our own freedom. Kant’s arguments for immortality and God as postulates of practical reason presuppose that the reality of the moral law and the freedom of the will have been established, and they also depend on the principle that “‘ought’ implies ‘can’”: one cannot be obligated to do something unless the thing in question is doable. For instance, there is no sense in which I am obligated to single-handedly solve global poverty, because it is not within my power to do so. According to Kant, the ultimate aim of a rational moral agent should be to become perfectly moral. We are obligated to strive to become ever more moral. Given the “ought implies can” principle, if we ought to work towards moral perfection, then moral perfection must be possible and we can become perfect. However, Kant holds that moral perfection is something that finite rational agents such as humans can only progress towards, but not actually attain in any finite amount of time, and certainly not within any one human lifetime. Thus the moral law demands an “endless progress” towards “complete conformity of the will with the moral law” (5:122). This endless progress towards perfection can only be demanded of us if our own existence is endless. In short, one’s belief that one should strive towards moral perfection presupposes the belief in the immortality of the soul. In addition to the “ought implies can” principle, Kant’s argument about belief in God also involves an elaboration of the notion of the “highest good” at which all moral action aims (at least indirectly). According to Kant, the highest good, that is, the most perfect possible state for a community of rational agents, is not only one in which all agents act in complete conformity with the moral law. It is also a state in which these agents are happy. Kant had argued that although everyone naturally desires to be happy, happiness is only good when one deserves to be happy. In the ideal scenario of a morally perfect community of rational agents, everyone deserves to be happy. Since a deserved happiness is a good thing, the highest good will involve a situation in which everyone acts in complete conformity with the moral law and everyone is completely happy because they deserve to be. Now since we are obligated to work towards this highest good, this complete, universal, morally justified happiness must be possible (again, because “ought” implies “can”). This is where a puzzle arises. Although happiness is connected to morality at the conceptual level when one deserves happiness, there is no natural connection between morality and happiness. Our happiness depends on the natural world (for example, whether we are healthy, whether natural disasters affect us), and the natural world operates according to laws that are completely separate from the laws of morality. Accordingly, acting morally is in general no guarantee that nature will make it possible for one to be happy. If anything, behaving morally will often decrease one’s happiness (for doing the right thing often involves doing the uncomfortable, difficult thing). And we all have plenty of empirical evidence from the world we live in that often bad things happen to good people and good things happen to bad people. Thus if the highest good (in which happiness is proportioned to virtue) is possible, then somehow there must be a way for the laws of nature to eventually lead to a situation in which happiness is proportioned to virtue. (Note that since at this point in the argument, Kant takes himself to have established immortality as a postulate of practical reason, this “eventually” may very well be far in the future). Since the laws of nature and the laws of morality are completely separate on their own, the only way that the two could come together such that happiness ends up proportioned to virtue would be if the ultimate cause and ground of nature set up the world in such a way that the laws of nature would eventually lead to the perfect state in question. Therefore, the possibility of the highest good requires the presupposition that the cause of the world is intelligent and powerful enough to set nature up in the right way, and also that it wills in accordance with justice that eventually the laws of nature will indeed lead to a state in which the happiness of rational agents is proportioned to their virtue. This intelligent, powerful, and just cause of the world is what traditionally goes by the name of “God.” Hence God is a postulate of practical reason. Kant’s ethical theory emphasized reason, autonomy, and a respect for the humanity of others. These central aspects of his theory of individual moral choice are carried over to his theories of humanity’s history and of ideal political organization. This section covers Kant’s teleological history of the human race (6a), the basic elements of his political theory (6b), and his theory of the possibility of world peace (6c). Kant’s socio-political philosophy must be understood in terms of his understanding of the history of humanity, of its teleology, and in terms of his particular time and place: Europe during the Enlightenment. In his short essay “Idea for a Universal History with a Cosmopolitan Purpose” (1784), Kant outlines a speculative sketch of humanity’s history organized around his conception of the teleology intrinsic to the species. The natural purpose of humanity is the development of reason. This development is not something that can take place in one individual lifetime, but is instead the ongoing project of humanity across the generations. Nature fosters this goal through both human physiology and human psychology. Humans have no fur, claws, or sharp teeth, and so if we are to be sheltered and fed, we must use our reason to create the tools necessary to satisfy our needs. More importantly, at the cultural level, Kant argues that human society is characterized by an “unsocial sociability”: on the one hand, humans need to live with other humans and we feel incomplete in isolation; but on the other, we frequently disagree with each other and are frustrated when others don’t agree with us on important matters. The frustration brought on by disagreement serves as an incentive to develop our capacity to reason so that we can argue persuasively and convince others to agree with us. By means of our physiological deficiencies and our unsocial sociability, nature has nudged us, generation by generation, to develop our capacity for reason and slowly to emerge from the hazy fog of pre-history up to the present. This development is not yet complete. Kant takes stock of where we were in his day, in late 18th c. Prussia) in his short, popular essay: “An Answer to the Question: What is Enlightenment?” (1784). To be enlightened, he argues, is to determine one’s beliefs and actions in accordance with the free use of one’s reason. The process of enlightenment is humanity’s “emergence from its self-incurred immaturity” (8:35), that is, the emergence from an uncritical reliance on the authority of others (for example, parents, monarchs, or priests). This is a slow, on-going process. Kant thought that his own age was an age of enlightenment, but not yet a fully enlightened age. The goal of humanity is to reach a point where all interpersonal interactions are conducted in accordance with reason, and hence in accordance with the moral law (this is the idea of a kingdom of ends described in 5b above). Kant thinks that there are two significant conditions that must be in place before such an enlightened age can come to be. First, humans must live in a perfectly just society under a perfectly just constitution. Second, the nations of the world must coexist as an international federation in a state of “perpetual peace.” Some aspects of the first condition are discussed in 6b, and of the second in 6c. Kant fullest articulation of his political theory appears in the “Doctrine of Right,” which is the first half of Metaphysics of Morals (1797). In line with his belief that a freedom grounded in rationality is what bestows dignity upon human beings, Kant organizes his theory of justice around the notion of freedom: “Any action is right if it can coexist with everyone’s freedom in accordance with a universal law, or if on its maxim the freedom of choice of each can coexist with everyone’s freedom in accordance with a universal law” (6:230). Implicit in this definition is a theory of equality: everyone should be granted the same degree of freedom. Although a state, through the passing and enforcing of laws, necessarily restricts freedom to some degree, Kant argues that this is necessary for the preservation of equality of human freedom. This is because when the freedoms of all are unchecked (for example, in the state of nature, which is also a condition of anarchy), the strong will overpower the weak and infringe on their freedoms, in which case freedoms will not be distributed equally, contrary to Kant’s basic principle of right. Hence a fair and lawful coercion that restricts freedom is consistent with and required by maximal and equal degrees of freedom for all. Kant holds that republicanism is the ideal form of government. In a republic, voters elect representatives and these representatives decide on particular laws on behalf of the people. (Kant shows that he was not free of the prejudices of his day, and claims, with little argument, that neither women nor the poor should be full citizens with voting rights.) Representatives are duty-bound to choose these laws from the perspective of the “general will” (a term Kant borrows from Rousseau), rather than from the perspective of the interests of any one individual or group within society. Even though the entire population does not vote on each individual law, a law is said to be just only in case an entire population of rational agents could and would consent to the law. In this respect, Kant’s theory of just law is analogous to his universal law formulation of the categorical imperative: both demand that it be possible in principle for everyone to affirm the rule in question (see 5b above). Among the freedoms that ought to be respected in a just society (republican or otherwise) are the freedom to pursue happiness in any way one chooses (so long as this pursuit does not infringe the rights of others, of course), freedom of religion, and freedom of speech. These last two are especially important to Kant and he associated them with the ongoing enlightenment of humanity in “What is Enlightenment?” He argues that it “would be a crime against human nature” (8:39) to legislate religious doctrine because doing so would be to deny to humans the very free use of reason that makes them human. Similarly, restrictions on what Kant calls the “public use of one’s reason” are contrary to the most basic teleology of the human species, namely, the development of reason. Kant himself had felt the sting of an infringement on these rights when the government of Friedrich Wilhelm II (the successor to Frederick the Great) prohibited Kant from publishing anything further on matters pertaining to religion. Kant elaborates the cosmopolitan theory first proposed in “Idea for a Universal History” in his Towards Perpetual Peace (1795). The basic idea is that world peace can be achieved only when international relations mirror, in certain respects, the relations between individuals in a just society. Just as people cannot be traded as things, so too states cannot be traded as though they were mere property. Just as individuals must respect others’ rights to free self-determination, so too, “no state shall forcibly interfere in the constitution and government of another state” (8:346). And in general, just as individuals need to arrange themselves into just societies, states, considered as individuals themselves, must arrange themselves into a global federation, a “league of nations” (8:354). Of course, until a state of perpetual peace is reached, wars will be inevitable. Even in times of wars, however, certain laws must be respected. For instance, it is never permissible for hostilities to become so violent as to undermine the possibility of a future peace treaty. Kant argued that republicanism is especially conducive to peace, and he argued that perpetual peace would require that all states be republics. This is because the people will only consent to a war if they are willing to bear the economic burdens that war brings, and such a cost will only be worthwhile when there is a truly dire threat. If only the will of the monarch is required to go to war, since the monarch will not have to bear the full burden of the war (the cost will be distributed among the subjects), there is much less disincentive against war. According to Kant, war is the result of an imbalance or disequilibrium in international relations. Although wars are never desirable, they lead to new conditions in international relations, and sometimes these new conditions are more balanced than the previous ones. When they are more balanced, there is less chance of new war occurring. Overall then, although the progression is messy and violent along the way, the slow march towards perpetual peace is a process in which all the states of the world slowly work towards a condition of balance and equilibrium. Kant’s most worked out presentation of his views on aesthetics appears in Critique of the Power of Judgment (1790), also known as the “Third Critique.” As the title implies, Kant’s aesthetic theory is cashed out through an analysis of the operations of the faculty of judgment. That is, Kant explains what it is for something to be beautiful by explaining what goes into the judgment that something is beautiful. This section explains the structure of aesthetic judgments of the beautiful and the sublime (7a), summarizes Kant’s theory of art and the genius behind art (7b), and finally explains the connection between Kant’s aesthetic theory and his moral theory (7c). Kant holds that there are three different types of aesthetic judgments: judgments of the agreeable, of the beautiful, and of the sublime. The first is not particularly interesting, because it pertains simply to whatever objects happen to cause us (personally) pleasure or pain. There is nothing universal about such judgments. If one person finds botanical gin pleasant and another does not, there is no disagreement, simply different responses to the stimulus. Judgments of the beautiful and the sublime, however, are more interesting and worth spending some time on. Let us consider judgments of beauty (which Kant calls “judgments of taste”) first. Kant argues that all judgments of taste involve four components, or “moments.” First, judgments of taste involve a subjective yet disinterested enjoyment. We have an appreciation for the object without desiring it. This contrasts judgments of taste from both cognitions, which represent objects as they are rather than how they affect us, and desires, which represent objects in terms of what we want. Second, judgments of taste involve universality. When we judge an object to be beautiful, implicit in the judgment is the belief that everyone should judge the object in the same way. Third, judgments of taste involve the form of purposiveness, or “purposeless purposiveness.” Beautiful objects seem to be “for” something, even though there is nothing determinate that they are for. Fourth, judgments of taste involve necessity. When presented with a beautiful object, I take it that I ought to judge it as beautiful. Taken together, the theory is this: when I judge something as beautiful, I enjoy the object without having any desires with respect to it, I believe that everyone should judge the object to be beautiful, I represent some kind of purposiveness in it, but without applying any concepts that would determine its specific purpose, and I also represent myself as being obligated to judge it to be beautiful. Judgments of beauty are thus quite peculiar. On the one hand, when we say an object is beautiful, it is not the same sort of predication as when I say something is green, is a horse, or fits in a breadbox. Yet it is not for that reason a purely subjective, personal judgment because of the necessity and intersubjective universality involved in such judgments. A further remark is in order regarding the “form of purposiveness” in judgments of taste. Kant wants to emphasize that no determinate concepts are involved in judgments of taste, but that the “reflective” power of judgment (that is, judgment’s ability to seek to find a suitable concept to fit an object) is nevertheless very active during such judgments. When I encounter an unfamiliar object, my reflective judgment is set in motion and seeks a concept until I figure out what sort of thing the object is. When I encounter a beautiful object, the form of purposiveness in the object also sets my reflecting judgment in motion, but no determinate concept is ever found for the object. Although this might be expected to lead to frustration, Kant instead claims that it provokes a “free play” (5:217) between the imagination and understanding. Kant does not say as much about this “free play” as one would like, but the idea seems to be that since the experience is not constrained by a determinate concept that must be applied to the object, the imagination and understanding are free to give in to a lively interplay of thought and emotion in response to the object. The experience of this free play of the faculties is the part of the aesthetic experience that we take to be enjoyable. Aside from judgments of taste, there is another important form of aesthetic experience: the experience of the sublime. According to Kant, the experience of the sublime occurs when we face things (whether natural or manmade) that dwarf the imagination and make us feel tiny and insignificant in comparison. When we face something so large that we cannot come up with a concept to adequately capture its magnitude, we experience a feeling akin to vertigo. A good example of this is the “Deep Field” photographs from the Hubble Telescope. We already have trouble comprehending the enormity of the Milky Way, but when we see an image containing thousands of other galaxies of approximately the same size, the mind cannot even hope to comprehend the immensity of what is depicted. Although this sort of experience can be disconcerting, Kant also says that a disinterested pleasure (similar to the pleasure in the beautiful) is experienced when the ideas of reason pertaining to the totality of the cosmos are brought into play. Although the understanding can have no empirical concept of such an indeterminable magnitude, reason has such an idea (in Kant’s technical sense of “idea”; see 2g above), namely, the idea of the world as an indefinitely large totality. This feeling that reason can subsume and capture even the totality of the immeasurable cosmos leads to the peculiar pleasure of the sublime. Both natural objects and manmade art can be judged to be beautiful. Kant suggests that natural beauties are purest, but works of art are especially interesting because they result from human genius. The following briefly summarizes Kant’s theory of art and genius. Although art must be manmade and not natural, Kant holds that art is beautiful insofar as it imitates the beauty of nature. Specifically, a beautiful work of art must display the “form of purposiveness” (described above, 7a) that can be encountered in the natural world. What makes great art truly great, though, is that it is the result of genius in the artist. According to Kant, genius is the innate talent possessed by the exceptional, gifted individual that allows that individual to translate an intangible “aesthetic idea” into a tangible work of art. Aesthetic ideas are the counterparts to the ideas of reason (see 2g above): where ideas of reason are concepts for which no sensible intuition is adequate, aesthetic ideas are representations of the imagination for which no concept is adequate (this is in line with Kant’s claim that beauty is not determinately conceptualizable). When a genius is successful at exhibiting an aesthetic idea in a beautiful work of art, the work will provoke the “free play” of the faculties described above (7a). Kant divides the arts into three groups: the arts of speech (rhetoric and poetry), pictorial arts (sculpture, architecture, and painting), and the art of the play of sensations (music and “the art of colors”) (5:321ff.). These can, of course, be combined together. For instance opera combines music and poetry into song, and combines this with theatre (which Kant considers a form of painting). Kant deems poetry the greatest of the arts because of its ability to stimulate the imagination and understanding and expand the mind through reflection. Music is the most successful if judged in terms of “charm and movement of the mind” (5:328), because it evokes the affect and feeling of human speech, but without being constrained by the determinate concepts of actual words. However, if the question is which art advances culture the most, Kant thinks that painting is better than music. One consequence of Kant’s theory of art is that the contemporary notion of “conceptual art” is a contradiction in terms: if there is a specific point or message (a determinate concept) that the artist is trying to get across, then the work cannot provoke the indeterminate free play that is necessary for the experience of the beautiful. At best, such works can be interesting or provocative, but not truly beautiful and hence not truly art. A final important aspect of Kant’s aesthetic theory is his claim that beauty is a “symbol” of morality (5:351ff. ), and aesthetic judgment thereby functions as a sort of “propaedeutic” for moral cognition. This is because certain aspects of judgments of taste (see 7a above) are analogous in important respects to moral judgments. The immediacy and disinterestedness of aesthetic appreciation corresponds to the demand that moral virtue be praised even when it does not lead to tangibly beneficial consequences: it is good in itself. The free play of the faculties involved in appreciation of the beautiful reminds one of the freedom necessary for and presupposed by morality. And the universality and necessity involved in aesthetic judgments correspond to the universality and necessity of the moral law. In short, Kant holds that a cultivated sensitivity to aesthetic pleasures helps prepare the mind for moral cognition. Aesthetic appreciation makes one sensitive to the fact that there are pleasures beyond the merely agreeable just as there are goods beyond the merely instrumental. Together with a course on “physical geography” (a study of the world), Kant taught a class on “pragmatic anthropology” almost every year of his career as a university teacher. Towards the end of his career, Kant allowed his collected lecture notes for his anthropology course to be edited and published as Anthropology from a Pragmatic Point of View (1789). Anthropology, for Kant, is simply the study of human nature. Pragmatic anthropology is useful, practical knowledge that students would need in order to successfully navigate the world and get through life. The Anthropology is interesting in two very different ways. First, Kant presents detailed discussions of his views on issues related to empirical psychology, moral psychology, and aesthetic taste that fill out and give substance to the highly abstract presentations of his writings in pure theoretical philosophy. For instance, although in the theory of experience from Critique of Pure Reason Kant argues that we need sensory intuitions in order to have empirical cognition of the world, he does not explain in any detail how our specific senses—sight, hearing, touch, taste, smell—contribute to this cognition. The Anthropology fills in a lot of this story. For instance, we learn that sight and hearing are necessary for us to represent objects as public and intersubjectively available. And we learn that touch is necessary for us to represent objects as solid, and hence as substantial. With respect to his moral theory, many of Kant’s ethical writings can give the impression that emotions and sentiments can only work against morality, and that only pure reason can incline one towards the good. In the Anthropology Kant complicates this story, informing us that nature has implanted sentiments of compassion to incline us towards the good, even in the absence of a developed reason. Once reason has been developed, it can promote an “enthusiasm of good resolution” (7:254) through attention to concrete instances of virtuous action, in which case desire can work in cooperation with reason’s moral law, not against it. Kant also supplements his moral theory through pedagogical advice about how to cultivate an inclination towards moral behavior. The other aspect of the Anthropology (and the student transcripts of his actual lectures) that makes it so interesting is that the wealth and range of examples and discussions gives a much fuller picture of Kant the person than we can get from his more technical writings. The many examples present a picture of a man with wide-ranging opinions on all aspects of the human experience. There are discussions of dreams, humor, boredom, personality-types, facial expressions, pride and greed, gender and race issues, and more. We even get some fashion advice: it is acceptable to wear yellow under a blue coat, but gaudy to wear blue under a yellow coat. There has been a great deal of renewed interest in Kant’s anthropological writings and many commentators have been appealing to these often neglected texts as a helpful resource that provides contextualization of Kant’s more widely studied theoretical output. The best scholarly, English translations of Kant’s work are published by Cambridge University Press as the Cambridge Editions of the Works of Immanuel Kant. The following are from that collection and contain some of Kant’s most important and influential writings. Critique of Pure Reason, trans. Paul Guyer and Allen Wood. Cambridge: Cambridge University Press, 1998. Critique of the Power of Judgment, trans. Paul Guyer and Eric Matthews. Cambridge: Cambridge University Press, 2000. Ernst Cassirer (Kant’s Life and Thought, tr. by James Haden. New Haven: Yale University Press, 1983 (originally written in 1916)) and Manfred Kuehn (Kant: A Biography. Cambridge: Cambridge University Press, 2002) both offer intellectual biographies that situate the development of Kant’s thought within the context of his life and times. For comprehensive discussions of the metaphysics and epistemology of Critique of Pure Reason, see Paul Guyer (Kant and the Claims of Knowledge. Cambridge: Cambridge University Press, 1987), Henry Allison (Kant’s Transcendental Idealism: An Interpretation and Defense, Second Edition. New Haven: Yale University Press, 2004), and Graham Bird (The Revolutionary Kant: A Commentary on the Critique of Pure Reason. Chicago: Open Court Press, 2006). For treatments of Kant’s ethical theory, see Allen Wood (Kant’s Ethical Thought. Cambridge: Cambridge University Press, 1999), Christine Korsgaard (Creating the Kingdom of Ends. Cambridge: Cambridge University Press, 1996), and Onora O’Neill (Constructions of Reason: Explorations of Kant’s Practical Philosophy. Cambridge: Cambridge University Press, 1990). For analyses of Kant’s aesthetic theory (as well as other issues from the Third Critique), see Rachel Zuckert (Kant on Beauty and Biology: An Interpretation of the ‘Critique of Judgment’. Cambridge: Cambridge University Press, 2010), Paul Guyer (Kant and the Claims of Taste. Cambridge: Cambridge University Press, 1997), and Henry Allison (Kant’s Theory of Taste: A Reading of the Critique of Aesthetic Judgment. Cambridge: Cambridge University Press, 2001). For studies of Kant’s anthropology and theory of human nature, see Patrick Frierson (What is the Human Being? London: Routledge, 2013) and Alix Cohen (Kant and the Human Sciences: Biology, Anthropology and History. London: Palgrave Macmillan, 2009).